Cartilage is the firm, rubbery tissue that cushions your bones at the joints. It allows bones to glide over one another. When the cartilage breaks down and wears away, the bones rub together. This often causes the pain, swelling, and stiffness of OA. As OA worsens, bony spurs or extra bone may form around the joint. The ligaments and muscles around the joint may become weaker and stiffer. Before age 55, OA occurs equally in men and women. After age 55, it is more common in women. Other factors can also lead to OA. Being overweight increases the risk for OA in the hip, knee, ankle, and foot joints. This is because extra weight causes more wear and tear. Fractures or other joint injuries can lead to OA later in life. This includes injuries to the cartilage and ligaments in your joints. Jobs that involve kneeling or squatting for more than an hour a day, or involve lifting, climbing stairs, or walking increase the risk for OA. Playing sports that involve direct impact on the joint (football), twisting (basketball or soccer), or throwing also increase the risk for OA. Symptoms of OA often appear in middle age. Almost everyone has some symptoms by age 70. With OA, your joints may become stiffer and harder to move over time. You may notice a rubbing, grating, or crackling sound when you move the joint. "Morning stiffness" refers to the pain and stiffness you feel when you first wake up in the morning. Stiffness due to OA often lasts for 30 minutes or less. It can last more than 30 minutes if there is inflammation in the joint. It often improves after activity, allowing the joint to "warm up." During the day, the pain may get worse when you are active and feel better when you are resting. As OA gets worse, you may have pain even when you are resting. And it may wake you up at night. Some people might not have symptoms, even though x-rays show the changes of OA. Blood tests are not helpful in diagnosing OA. OA cannot be cured. It will most likely get worse over time. However, your OA symptoms can be controlled. Over-the-counter (OTC) pain relievers, such as acetaminophen (Tylenol) or a nonsteroidal anti-inflammatory drug (NSAID)can help with OA symptoms. You can buy these medicines without a prescription. It is recommended that you DO NOT take more than 3 grams (3,000 mg) of acetaminophen a day. If you have liver disease, talk with your provider before taking acetaminophen. OTC NSAIDs include aspirin, ibuprofen, and naproxen. Several other NSAIDs are available by prescription. Talk with your provider before taking an NSAID on a regular basis. Duloxetine (Cymbalta) is a prescription antidepressant that can also help treat long-term (chronic) pain related to OA. Staying active and getting exercise can maintain joint and overall movement. Ask your provider to recommend an exercise routine. Water exercises, such as swimming, are helpful. If the pain from OA gets worse, keeping up with activities may become more difficult or painful. Making changes around the home can help take stress off your joints to relieve some of the pain. If your work is causing stress in certain joints, you may need to adjust your work area or change work tasks. Physical therapy can help improve muscle strength and the motion of stiff joints as well as your balance. If therapy does not make you feel better after 6 to 8 weeks, then it likely will not work at all. Massage therapy may provide short-term pain relief. Make sure you work with a licensed massage therapist who is experienced in working on sensitive joints. Splints and braces may help support weakened joints. Some types limit or prevent the joint from moving. Others may shift pressure off one portion of a joint. Use a brace only when your doctor or therapist recommends one. Using a brace the wrong way can cause joint damage, stiffness, and pain. Acupuncture is a traditional Chinese treatment. It is thought that when acupuncture needles stimulate certain points on the body, chemicals that block pain are released. Acupuncture may provide short-term pain relief for OA. Yoga and tai chi have also shown some benefit in treating the pain from OA. S-adenosylmethionine (SAMe, pronounced "Sammy") is a manmade form of a natural chemical in the body. It may help reduce joint inflammation and pain. Knee joint replacement is a surgery to replace a knee joint with a man-made artificial joint. The artificial joint is called a prosthesis. Elbow replacement is surgery to replace the elbow joint with artificial joint parts (prosthetics). Which Osteoarthritis Treatment Is Right for You? Which of these medicines can help relieve osteoarthritis (OA) pain? The correct answer is all of the above. Your doctor may recommend acetaminophen first, because it has fewer long-term side effects than the others. If your pain continues, your doctor may recommend other pain relievers. Always ask your doctor which medicine is safest for you and how much to take. Exercise is one of the best treatments for arthritis pain. The correct answer is true. Staying active not only helps reduce pain, but also relieves stiffness, boosts your energy, and improves bone and muscle strength. But some sports or exercises may make your pain worse. Work with your doctor or physical therapist to develop an exercise routine for you. The correct answer is all of the above. Losing extra pounds can take pressure off joints in the legs and feet. Getting enough sleep helps you recover more quickly after a flare-up. And eating a balanced diet helps keep your whole body healthy. Physical therapy can benefit many people with OA. The correct answer is true. Physical therapy can help improve muscle strength and the motion of stiff joints, as well as your sense of balance. Therapists have many techniques for treating OA. If you don't get relief, ask your doctor about other treatment options. The correct answer is all of the above. Glucosamine, chondroitin sulfate, and capsaicin cream have all been shown to help relieve OA pain in some people. Talk to your doctor about which over-the-counter remedies may work best for you. Which of the following treatments is better for OA pain? The correct answer is both heat and cold. Hot packs, warm towels, or taking a warm bath can help increase blood flow and make your joints more flexible. Cold packs can help numb the painful area and reduce joint pain. Work with your doctor to see what works best for you. You should only use a brace if your doctor recommends it. The correct answer is true. Splints and braces can sometimes support weakened joints. Some prevent the joint from moving; others allow some movement. You should use a brace only when your doctor or therapist recommends one and ask how to use it. Using a brace the wrong way can cause joint damage, stiffness, and pain. How often can you receive corticosteroid injections to treat pain? The correct answer is two to four times a year. Corticosteroids are hormones that help reduce swelling in the joint. They are effective as a short-term treatment to relieve joint pain. However, experts recommend that you have no more than four injections a year. If you have OA, you’ll need to have surgery sooner or later. The correct answer is false. Although you may need to have surgery if your symptoms are severe, many people can treat their symptoms without ever having surgery. Talk to your doctor about what treatments may help relieve your OA pain. The only type of surgery for OA involves replacing the joint. The correct answer is false. Although joint replacement surgery is common, other surgeries can repair a damaged joint. If you are thinking about surgery, talk with your doctor about all of your options. 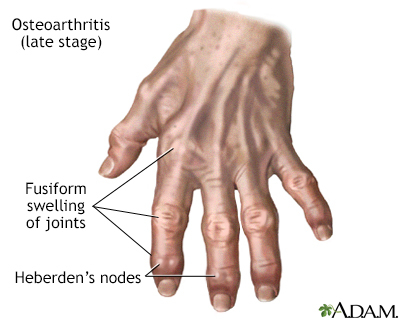 Organizations that specialize in arthritis are good resources for more information on OA. Your movement may become limited over time. Doing everyday activities, such as personal hygiene, household chores, or cooking may become a challenge. Treatment usually improves function. Call your provider if you have symptoms of OA that get worse. Try not to overuse a painful joint at work or during activities. Maintain a normal body weight. Keep the muscles around your joints strong, especially the weight-bearing joints (knee, hip, or ankle). Block JA, Scanzello C. Osteoarthritis. In: Goldman L, Schafer AI, eds. Goldman-Cecil Medicine. 25th ed. Philadelphia, PA: Elsevier Saunders; 2016:chap 262. Felson DT. 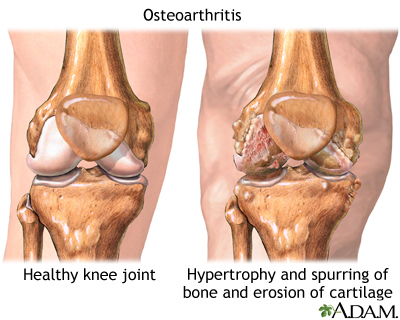 Treatment of osteoarthritis. In: Firestein GS, Budd RC, Gabriel SE, McInnes IB, O’Dell JR, eds. Kelly and Firestein's Textbook of Rheumatology. 10th ed. Philadelphia, PA: Elsevier; 2017:chap 100. Hochberg MC, Altman RD, April KT, et al. American College of Rheumatology 2012 recommendations for the use of nonpharmacologic and pharmacologic therapies in osteoarthritis of the hand, hip, and knee. Arthritis Care Res. 2012;64(4):465-474. PMID: 22563589 www.ncbi.nlm.nih.gov/pubmed/22563589. Zhang W, Ouyang H, Dass CR, Xu J. Current research on pharmacologic and regenerative therapies for osteoarthritis. Bone Res. 2016;4:15040. PMID: PMC4772471 www.ncbi.nlm.nih.gov/pmc/articles/PMC4772471.